Journal of the Aerovox Corporation, manufacturer of capacitors. Aerovox was founded in 1922 as Radiola Wireless Corporation, a manufacturer of radio sets. The company became a major manufacturer of capacitors by the late 20's. 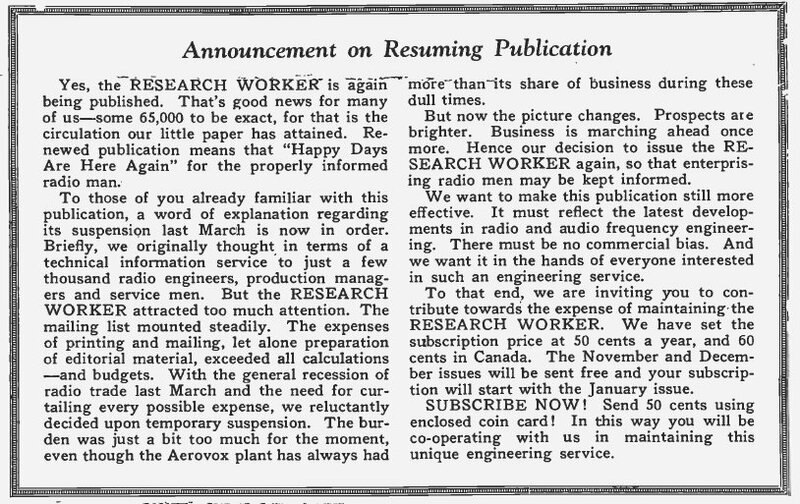 In 1928 it began publishing the Aerovox Research Worker to promote applications and best uses for its products. Publication was halted due to costs in the depression years of 1932 and 1933 but the magazine came back in November of 1934 as the economy improved. Believed to Have Ceased Publication in 1967 with Jan-June Issue.